As one of the original team members planning the Future City Competition and eventually its National Director, Carol Rieg has a perspective on the program that few others can match. In 1991, Carol was brought on board by IEEE-USA to join the team that was tasked with evolving a barebones sketch of an idea into a fully realized execution. 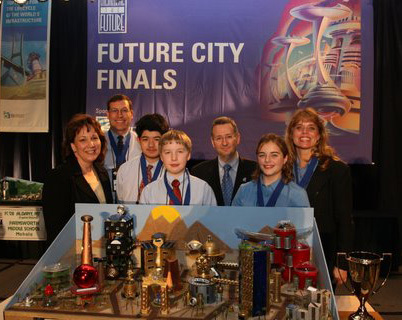 During her 16 year tenure with Future City, the Competition went from a few regions, to the larger National and International program it is today. Carol says, in those first years, the biggest challenge was getting others to believe in the positive impact Future City would have on schools and communities. The Future City founders built a network of engineers to bring the program into schools, recruiting mentors and training the regional coordinators. They also contributed to the development of the basic principles of Future City that still guide the program today: design, build, research/write and present. Carol recalls how, in those first years, the SimCity software that is still central to the competition, came on 5 ¼ inch floppy disks.